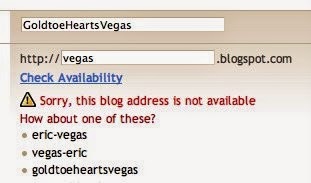 Now that you have a Blogger account all set up, you need to choose a name for your blog. If this blog is a keeper, and not just a writing sandbox to test your skill, you should really give this a great deal of thought. So, whats in a name? Your name will convey your tone and content. Its the first thing readers will see and hear from your blog. If you plan on using your very first blog as a test space, don't fret! Choose any name but make sure its one you can remember. 1. Type the name in the blog title field. Your web address is called a URL (short for Uniform Resource Locator). Visitors will use this word or phrase ans type it into their address bar of their web browser to get to your site. Your address can be 35 characters long. You can use anything as your URL, except spaces and no punctuation, with the exception of dashes. Its a good idea to keep it short, catchy, similar to the title of your blog and something memorable so people will easily think of the name. This will check to see if someone has already picked the same name you have or of its available. If the URL you want is already taken, you'll have to come up with another one.